The actor and director Mario Van Peebles (New Jack City, Baadasssss!) seems an unlikely choice to direct a film about the sinking of the USS Indianapolis, the naval disaster given big-screen notoriety by a monologue in Jaws. But who could have guessed that the result would be insipid? 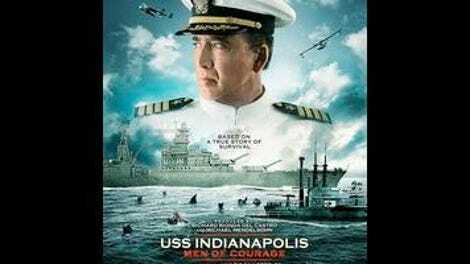 USS Indianapolis: Men Of Courage, which stars the pathologically available Nicolas Cage as the captain of the doomed ship, is equal parts cheap shark attack movie, crappy wartime weepie, and hackneyed courtroom drama. Like the fella says, every expense has been spared: The sets are either claustrophobically limited or anonymously empty; the period detail is nonexistent; and the special effects are on par with a Syfy original. The fascinating and sad story of the Indianapolis has no shortage of foibles and conflicts. The ship transported the uranium that would be used in the atomic bomb dropped on Hiroshima and was torpedoed in the last Japanese naval victory of World War II, its survivors left for days in shark-infested waters due to incompetence, leading to a scapegoating court martial after the war. The script, by producers Cam Cannon and Richard Rionda Del Castro (Rage, I Am Wrath, and assorted other bargain bin specials), tries to cover all of these things; it scatters itself, giving time to Capt. Charles McVay (Cage), assorted barely differentiated crew members, and even Capt. Mochitsura Hashimoto (Yutaka Takeuchi), commander of the submarine that sunk the Indianapolis. None of this seems to interest Van Peebles. The inconsistent but spirited filmmaker who filled the likes of Posse and Panther with canted angles and wacky frames has in recent years become a completely anonymous journeyman of network TV, and he gives Men Of Courage only the faintest aftertaste of a personality. This overlong, plodding film has notes of both patriotism and cynicism, but no clue how to really muster either on screen. Even something as surefire as a fight between black and white sailors in an alleyway gets the same cursory, featureless direction. 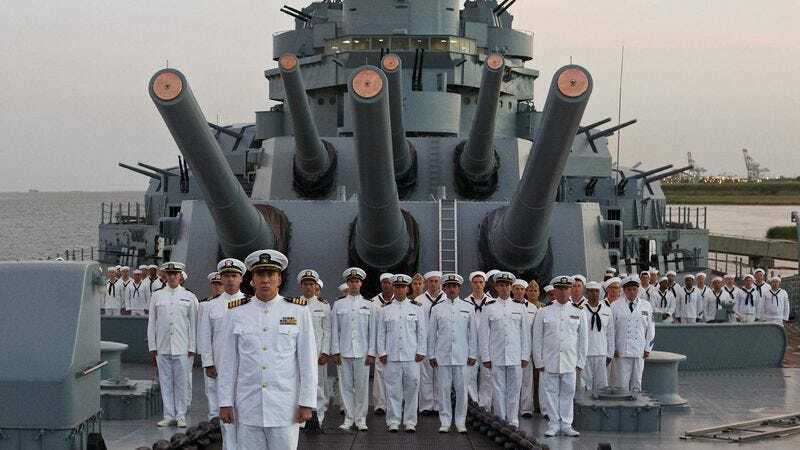 The movie is perversely undistinguished: the tension-less depiction of men dying at sea; the ham-fisted but undramatic court martial scenes that give the film its lengthy epilogue; and the dialogue that’s one half boilerplate and one half crude exposition. One almost has to wonder what it takes to put Cage in a movie with Tom Sizemore (as the ship’s chief petty officer) and Thomas Jane (as the pilot who first spotted the survivors) and still arrive at dullness. At least Cage retains his knack for making inconsequential lines (“What do you put in these delicious pies, Theodore?”) sound like something only a madman would say, even as he underplays his already underwritten role. Bless his heart, he fully and awkwardly commits to McVay’s eventual anguish, straining through real tears for a character with no depth. It’s the kind of moment only B-movies can provide, though Men Of Courage completely embraces that side of itself only once, in a brief scene where a sailor is chomped in half by a cheap CGI shark while vomiting off the side of a life raft.